So, before I look at the Salford game and a fine victory, I feel I have to go back a bit and discuss just what happened against Warrington, if only to get it out of my system. I’ve had a week off and the way it was against the Wire, perhaps that’s a good thing, for I was fuming!! It’s old news now I guess and after Salford perhaps to some fans pretty academic, but I have to comment, because I love my club and such ‘showing up’s’ are just not fair on a group of fans who have over the years given their all, made the sacrifices and stayed true. Nor is it fair on those who can’t travel away to witness what are fast becoming our best performances. We have, in years gone by, showed the guts, determination and pride in the shirt we saw at Salford, wherever and whoever we played, but now on occasions, we just seem to be devoid of any of those qualities. We all love to win and most don’t mind seeing a defeat if we have tried our best and heaven knows we always try to understand whatever happens, but you can’t compare that home performance with what we saw yesterday. Although perhaps we should be questioning why we are still experiencing so many injuries, we always try to understand and in the end only ask for pride and passion from whoever is out there. To see such a gutless performance laid bare on national TV, followed by this one full of passion, is just so hard to accept and completely bemusing. For me, yesterday was so far removed from a game just 9 days earlier, in which with the exception of the moment when the great Keith Boxall brought out the match ball, there was no evidence of any sort of passion at all. We just can’t take that sort of massive reversal, shrug our shoulders and as an organisation just move on, AGAIN, can we? It was as bad if not worse than what went on at home in the David Lloyd years and as a fan, it just breaks your heart!!! I certainly chose a good week to have a few days away in Tenerife didn’t I? Needless to say, I viewed the Warrington debacle on my phone and as I watched in horror some of the worst rugby I have seen from an FC team since we moved to the KCOM, I was almost pleased that I wasn’t there. If Warrington were hot, then we were still in the fridge!! We were given the same old injury excuses last year, but for me, all this injury business doesn’t really add up. For instance, if Langtree and Nzoungou were signed as good enough, why haven’t we seen them play first team rugby in such an injury wrecked campaign? We were assured the reason that we didn’t make any big signings this season was to guard against any such crisis in the future by having a big squad. However, last week the main issue was not us not sticking to our systems, boring though they sometimes are, because for me and thousands of others, it was more about the lack of any sort of passion from the players all of whom simply capitulated. When a rather naive Jordan Lane said this week, “Sometimes you just don’t turn up in games”, it said it all really. Don’t You Jordan????? Surely whoever plays, we have to see some pride in the shirt, don’t we? Another point that seems to be constantly missed is that when we produce such bloody awful performances it’s all ‘we know what we have to do’ and ‘we didn’t see that coming’ and this week, ‘We’ll use the pain of last week’s defeat to spur us on at Salford”. The issue is though, that we shouldn’t have to switch it on and off from one week to the next. It’s just not the stuff that we are made of. If you go down by say 40, fighting for every blade of grass against a red hot Warrington its acceptable, but that capitulation was unforgiveable. Good strong groups of players who are bonded and use their unity to play above themselves and even win things like we did in 2016/2017, is the stuff that great teams are made of. However, when it’s the same old players showing the same old inadequate effort in occasional games and then issuing the same old excuses on Monday, it all wears a bit thin. One win from the first four at home is just not acceptable; fortress KCOM it is not! Mind you, perhaps we have to shoulder a bit of the blame there, because at times the place has been more like a mausoleum than our home ground. It often embraces an atmosphere that is church like and hardly conducive to lifting the team but atmosphere is fired by excitement and we have seen precious little of that at home this year. So, to say I was disappointed with our attitude and application is an understatement and as the Salford game approached we were trotted out the same old ‘11 players missing’ stuff as if a win would be some sort of minor miracle. I’m not shroud waiving here, because I always look on the bright side of things as you know, but let’s face it, we were told that displays like those two at Wakey and Warrington last year would never be repeated, yet last weekend they were! I couldn’t see much changing at the home of the Red Devils with 11 injuries this weekend, but I was at least looking for my team to prove me wrong and battle to get some pride back. I wanted a win, but what I needed more was to see some proper and traditional Hull FC heart and passion and thankfully I got it in a performance that brushed over things a bit but didn’t completely dispel the memory of that Warrington game. The odds were stacked against us though, because even when facing a flagging Salford outfit in the wide open ‘echoey’ spaces of their Greater Manchester ground, it’s always a hard place to go to and often at times, rather like playing in a library. Those surroundings and their lack of any sort of ambience is certainly something that the home team have got used to, but it’s an atmosphere that can often unsettle the visitors from the off. One thing was for sure, our lot of diehard fans, unlike our home audience, would certainly make some noise. As the teams ran out, it was certainly a baptism of fire for young Connor Wynne in his number 36 shirt and it was good to see Jack Logan back in the centre in Greater Manchester, were for once the weather was OK. Of course the hosts included old boy Jansin Turgot, who had a point to prove, but we had Salford old boys Sneyd, Taylor and Griffin to counteract that and so the stage was set for …well we weren’t really sure were we? The FC kicked off and defended well in the first set which ended with us getting seven tackles back after Lui kicked dead on the 6th, after which our first hit up ended with Taylor getting a good penalty which saw us start 25 meters out. Salford stopped us twice on the line, but to no avail. Back we came to the line with fresh ideas and from Marc’s next pass Griffin crashed over for his and Hull FC’s first try of the afternoon. It was a great start. Then Taylor found another great carry out of yardage to gain a penalty, but again we wasted the chance as a forward pass from Houghton saw the threat defused. With everyone’s hearts in their mouths young Wynne took his first high floating kick well and then with fifteen minutes on the clock Salford amazingly conceded their fourth penalty. It was the sort of possession you need to capitalise on and Sneyd decided in that vein to take a pot at goal. At 8-0 we were in an unlikely lead. Wynne confidently defused a real ‘end over end’ bomb before Salford were put on a team warning after an in-disciplined first quarter, but as we went down field again we twice failed to capitalising on the mountain of possession we were enjoying. Three back to back sets for them spelled danger but with Wynne shouting the orders from full-back, we looked to be doing ok, before a kick through by Lui saw, one-time FC target, Josh Jones, chase through to touch-down and it was 6-8, with 20 minutes gone. Salford became more dominant as the game wore on and almost inevitably they were over again, but thankfully Sneyd was taken out and it didn’t stand. However, having just got possession back, on the second tackle Westerman, (who had a patchy game to say the least), knocked on not too far out from our line. We’d got out of jail once and all Logan could do to stop another score was to knock the ball forward between players as a sweeping Salford move was thwarted. More competent defence by the big men kept them out and it was set for set again, with whichever team conceded a penalty suffering. Taylor was outstanding in this spell as we withstood a real battering, before a kick through by Salford saw Griffin drop the ball and ‘a second bite’ after a massive defensive effort by Jack Logan, saw him sin binned. That was for me, a bit of a harsh decision. So, with Salford on the front foot, we had to face the final seven minutes of the half with 12 men. However, in what was a critical phase of the game, our spirits rose and a great break by Wynne saw us charge down-field again in a move that eventually ended with us forcing a goal-line drop out. Their kick then went out on the full, Sneyd went for goal to stretch our lead and it was 10-6 to the FC. 12-man Hull, deciding attack was the best form of defending when a man short, flowed forward again before Fairamo was held up over the line. He had done really well but typical of Hull FC, a wastefully poor pass in the next passing movement by the same winger, gave the ball away. As the hooter went we had managed to hold out for 8 minutes with 12 men in a game that Salford may have felt they should have been winning. I guess despite me finding it very hard to get that Wire match out of my system, we’d shown a lot more passion than in that game and any lead at half time was always going to be welcome. The second half started with Salford running hot before we got down-field and somehow as the Salford defenders froze, Griffin, held over the line, gave us the best of starts as he snaked his arm out to put the ball down for his second try and with a great touch-line conversion from Sneyd we were on the up again. Griffin then did it again, as we moved the ball wide, drawing opposition players as we went, Josh found himself in the open and he charged in to stretch the lead further. The feckless Westerman came on and promptly lost the ball again and then Houghton ensure our new found momentum was lost altogether, as he gave away a penalty. Targeting Savelio and running at him at every opportunity, Salford pressed us before Wynne off loaded badly to make his first real mistake and we were under the cosh again. Ellis did well to defuse a kick through, but we were forced to drop out again and the pressure was certainly on as we had to defend our fourth set on the trot, before almost inevitably Salford scored in the corner as Evalds scooted in. Didn’t he used to play for us?? Josh’s ex-team mates look on as he scores his hat trick. At 20-10 to the opposition the game was in the balance again before infuriatingly Kelly knocked on again. We kept giving them the bloody ball back and they were really ‘knocking on the door’, but then in an effort to milk a penalty, Salford gave the ball up and we breathed again. That penalty saw Sneyd stretch the lead to 12 points before Logan dropped a big clanger when, trying too hard, he got his hand on the ball and gave away another six from which Hastings slid over the line and it was all back on again. We now had to scrap for our lives, but, as he was introduced, two great tackles by Washbrook got us possession back and showing great foresight and poise early in the next set, man of the match Sneyd dropped a goal, to make it a 7-point game with seven minutes to go. That was a master stroke that made Salford (who possibly had an eye on at least the Golden Point) panic and they goofed with the short kick-off but then proceeded to batter us backwards remorselessly. Needing to get away from our own line, it was mastermind Sneyd who produced a great kick to turn full back Evalds and buy us some much needed yardage, before Marc dropped on a fly kick near the corner flag at the end of the next set, as he defused another dodgy situation. Savelio then went down in a tackle and looked really badly injured. Had we been just 6 points down we might have crumbled, but in a breathless last few minutes that seven-point cushion masterminded by Sneyd saw us stand tall, and with several players screaming encouragement to each other we battled on, before a big tackle from Tumavive and Kelly stopped the home team on the sixth tackle on the line with 40 seconds to go and at 23-16 that was it. Two oh so valuable points, were in the bag. We had really been under tremendous pressure in that second half, but we survived and what a good win it was. It was certainly no frills stuff but with so much heart on show and so much of a will to win across the line, you had to wonder where all that was last week. That for all of us, is the big FC conundrum isn’t it? Connor Wynne what a proud day it was for him! 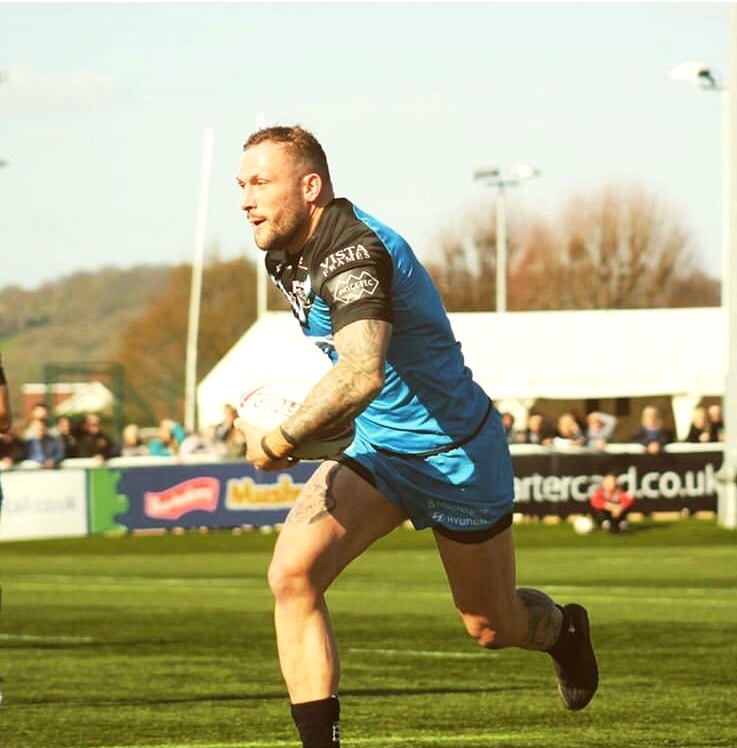 It was a great performance by all the FC players on show and what we lacked in finesse and composure we made up for in passion and wanting, but for me the man of the match was undoubtedly ‘game manager’ Marc Sneyd who made tries created room and kicked us out of pressure positions throughout the last quarter. Behind him were a much improved top meter maker Mini, the bulldozing Taylor and hat trick hero Griffin (who epitomised our problems, being quite amazing, after being woeful against Warrington), whilst on the debit side I thought Kelly had a poorish game, where nothing went right for him and he was joined on that ‘step by Joe Westerman who worked hard but lost the ball a time or two as well. However, as I say, throughout the team there was no faulting the effort and that’s all we can ask. With injuries to Taylor and Savelio it will be another busy week at County Road though! 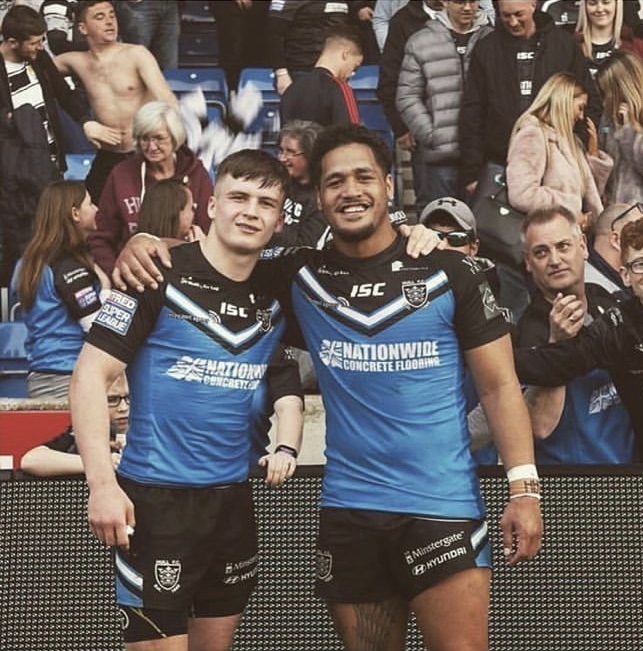 So to other things and the situation concerning Hakim Miloudi with his one-month loan to Toronto seeming to be pointing towards the likely end of his career at Hull FC. It will I think, reading his comments on social media, be the end of the road for him. He had a stinker against Warrington, but so did just about everyone else! For me, he has become a bit of a scapegoat when it comes to the blame game and obviously isn’t Lee’s flavour of the month. It appears his cavalier, devil may care Gaelic attitude to off the cuff rugby is sighted as being his downfall, yet shouldn’t that be cultivated a bit because for me perhaps there is a player in there somewhere. In fact, just drafted in often out of position, when we are desperately short handed, I guess that the kid hasn’t really been given a chance! I well remember the same conversations and comments coming out of County Road about Jake Connor in his early days with us, but look where he ended up: as maybe the best off the cuff player in the country! I don’t say Hakim will make it, but with all the robotic, structured, low risk players we are seeing every week across the game, a modicum of flair however wayward has to be something that should be risked, nurtured and hopefully developed. We might have a few creative players in Sneyd , Connor, Shaul, Albo and Westerman but even when we are playing well it’s still all very structured and planned isn’t it? I guess then what I’m saying is that Hakims move to Toronto should be just a development opportunity to get him game time against championship opposition. However, we all know now that with his contract up at the end of the year he’s been scrap heaped. No doubt he’ll go whilst we retain good ‘company men’ that tow the line, do nothing startling, but conform to our very structured way of life at the FC. We’ll see I guess but I’m sorry we didn’t persist with him myself. I read a really interesting article whilst I was away about the state of the game. 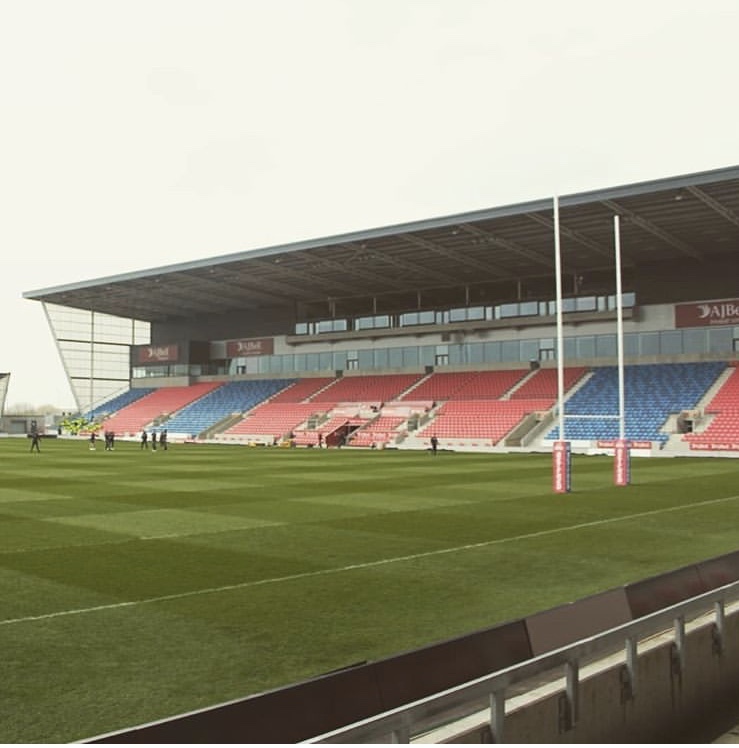 Under the title of ‘Away support in Super League is plummeting and its easy to see the reason why!’ it expounded the view that the cost of away tickets was severely effecting the numbers of folks who travel away for games in 2019. I took the point because costs do fluctuate considerably with Leeds and would you believe, Salford, the most expensive on match day at £27. We are next on £26, with Huddersfield and would, you believe again Wakefield the next up at £25. I say the ‘would you believe’ bit, because let’s face it Salford, the second worst supported Super League Club (after London) and Huddersfield who are just behind them, should both be doing all they can to attract more people through the gate and at Wakefield and Leeds away fans are charged abhorrent amounts to stand in the open air and brave the elements, whilst the home fans are housed under cover after paying the same or in some cases less in admissions. I know that economic factors are paramount but if a supporter can manage to get all the way to a game with the cost that entails in the first place, a quid or two here or there is to be fair pretty academic I guess. However, you have to, as is always the case in life, put a price on what you are buying and then see how your estimation of its value matches that of the suppliers. I mean to say should you be paying to have water running out of your shoes at Leeds, in a position where you can’t see the score board or the replay screen, when you can sit in the dry on the half way line at the KCom for a pound less? However, when it comes to what is affecting away attendances for me it down to a lot more than how much clubs charge, for the amount of televised rugby and the blight of Thursday night games also comes into play when some fans are choosing whether to go away to watch their team. At least this year Elstone and Co have arranged Thursday games at clubs in closer proximity than used to be the case when Sky picked them and the Rugby League just agreed. Let’s face it, we have been at Widnes twice on Thursday in the last five years and you don’t get a longer journey than that for an FC fan do you? Then of course there is the issue, with those games, of it being school and work next day and even after a trip to say Huddersfield it can be way past 11-30 before you get home. Again that’s a real turn off for young families! All fine of course for Sky, but difficult for the real fans who are travelling supporters. There are other issues as well, because Friday away games can be a long haul across the Pennines in shocking traffic that people who leave work at 5 or 5-30pm have always found hard to do. Of course Sky asked for kick offs to be moved 15 minutes earlier to 7-45pm and as a game we gave in immediately, so it just gets 15 minutes harder. I have seen my mates only just getting in for the start at Wigan, when it was 8-00pm kick-offs so now, as the traffic gets progressively worse, they are really struggling to get right over there for 7-45pm. It’s no good the RL blaming the fans for not turning up because when you stack all that lot up, who can blame fans for not making the trip. So I guess it’s down to a lot more than admission prices and if we really care about away supporters, then, as we saw with that turn out yesterday, the game should revert to Sunday afternoons, but with Sky the main, nay only real paymaster in the game, that aint gonna happen is it? When I saw this pic from the London game I thought Josh Griffin was running home with a pizza under his arm! The death last week of hero of my teens and thoroughly nice guy Terry Devonshire saw another great ex-player depart from our midst. Terry was a superb half back who would have no doubt gone on to International honours, had he been playing in a better team. but the early 60’s were a tough old time for Hull FC. His record career and exploits have been well documented in the media and so in tribute to Terry I include here an extract from Book One which describes how a young Terry became a real hero in a packed Easter Weekend programme back in 1965. “ ……however that Easter when all the headlines on the TV and in the papers were being made by the ‘Mods and Rockers’ battling on the beach at Brixham, Clacton and Brighton, this FC fan had other things to do, with a busy Easter programme for the Black and Whites, and two home games on consecutive days. In fact, in 1965 we played three games in four days backing up a Good Friday fixture against the old enemy at the Boulevard with another home game against Wakefield and an away game at Bradford two days later on Easter Monday. We had already lost 14 games that year and were well behind Hull Kingston Rovers in the League table and so as I made my way to the Boulevard in my new Parka (which I did everything but sleep in) for a noon kick off on Good Friday, I was fearing the worst as we had now got the unenviable record of having been beaten in the last ten League meetings against Hull Kingston Rovers. The Rovers fans had, as usual, been gloating over this record and the fact that they had finished higher than us in the last two seasons. The fact that we had finished above then for the previous 28 seemed to have been missed completely but as we all know, sports fans and particularly local rivals, have pretty selective memories when it comes to historical facts. However although I was still only 14 years that old that awful feeling was already starting to grip me! I was already churned up physiologically by the magnitude of these Derby’s games and felt it in the pit of my stomach in that horribly sickly way that only the ardent fan who has suffered heartbreaking defeat at the hands of the ‘infidels’ understands. The Match turned out to be a really tough and bruising forward game but Derby’s always were back then, however on this occasion the massive Rovers pack full of ‘big names’ came up against a Hull team that was really ‘pumped up’ by the occasion. We battered the ball carriers in the first few exchanges and despite a Kellett penalty putting them 2-0 up we opened our scoring after just eight minutes. A great pass from Cyril Sykes found Keegan who ran up from full back and split the defence wide open as only he could do and as Moore and Blackmore closed in, he turned back inside and found David Doyle-Davidson, who was making a rare start in the centre and he ran in untroubled for the easiest of tries. That gave us a 3-2 lead but then Hull defence squeezed the opposition into the middle of the field and would not let tricky scrum half Dave Elliot get the ball out wide to the fast and impressive looking Rovers back division. This action meant that a lot of niggle and tension crept into the game as the 16,500 crowd created a cauldron of atmosphere as both camps exchanged ‘compliments’ and taunted each other. Several ‘face outs’ on the pitch had threatened to boil over as old scores came to the fore and Kellett who was really on form with the boot landed three penalties, which stemmed from these skirmishes, to put the opposition in the lead again. Then at last Elliot moved the ball wide. A great pass to Burwell was shifted onto Blackmore un-marked on the wing, Brian Sullivan and Stocks tracked back across to try and nail the Rover’s winger but in the end it was scrum half Kenny Foulkes and Terry Devonshire that hammered him to the ground just ten yards from the try line. Up sprung the Rovers player to exchange blows with Foulkes who was still struggling to regain his feet, Devonshire waded in to help his mate and immediately referee Ernie Clay sent Blackmore from the field. Although they were down to 12 men, some real battling defence from the Rovers pack saw them still in the lead at half time. Kellett landed another goal just after the re-start but after that it was all Hull. A high tackle by Poole saw Eric Broom fire home a great 40=yard penalty and then after Flanagan had been caught off side, he got another from a lot closer in. Then we saw the try of the weekend. Terry Devonshire picked up a loose ball in his own 25-yard area and started off down the field. With such short legs he seemed to be moving a lot faster than he actually was but despite the best attempts of Mullins, Moore and Burwell he outstripped all the chasers, got to the line and touched down just to the right of the posts. Broom landed the conversion and with 20 minutes to go we led by the slender margin of 12-10. They were nervous times indeed for a young fan and the last quarter was certainly not all plain sailing as Rovers threw everything at us to try and get a result. They had us rocking at times as Poole, Holliday, Fox and Foster tore into the heart of our defence. On one particular occasion, Rovers who monopolised possession from the scrums broke away and Flanagan stepped around Keegan and on toward the line before he was caught inches short by David Doyle-Davidson. In the end our half backs Foulkes and the imperious Devonshire had been just too good for Rovers and thanks to our brilliant defence in that second half we came out winners 12-10. The good sports amongst the FC fans shook hands with the Rovers’ supporters and wished them well, whilst us ‘Airlie Street Mods’ just posed in our parkas pulled faces at them and laughed! Next day, Saturday, we were at home again and 7,500 people paid £925 to watch us take on Wakefield Trinity who were having their first game of the holidays. Despite a crunching encounter just 24 hours previously we made just one change from the team that played Rovers, with Trevor Carmichael coming in for Stocks at centre. This was surprisingly a game where our players showed no ill effects whatsoever and before the kick off Terry Devonshire received an award from the ‘Programme Club’ for being young player of the year whilst Arthur Keegan as usual received the fan’s player of the year award. This was another really exciting game for us spectators crammed into the Threepenny’s as after two penalties by Eric Broom we went on to score the first try when Carmichael sent that man Devonshire bobbing and weaving through the line and in again under the posts. However, Wakefield were soon back on terms by half time with two goals from Fox and a try from Hopwood. In the second half Terry Devonshire shot in again from a short ball on the inside from Foulkes and although both Fox and Broom exchanged penalties we came out winners 16-13. With almost the last play of the game Devonshire punched ex International sprinter, turned Wakefield winger Berwyn Jones, and was sent off by ‘Sergeant Major’ Ernie Clay who was officiating his second game in 24 hours at the Boulevard. So with three tries, two winning pay packets and a sending off it was an eventful two days for young stand-off Terry Devonshire. He was a brilliant half back so condolences to Family and Friends thanks for the memories Terry and R.I.P. Terry Devonshire. So there we are, what a difference a week makes eh? I’m sorry to labour on that defeat last week, but I honestly believe that such occasional humiliations are becoming something that is endemic at our club and after yesterday, it’s hard to understand why everyone can’t turn up as mentally prepared as that every week. Some would say that RL players only really do any really meaningful work for 80 minutes a week and surely they can be switched on every time they do it? In reality of course it’s a hard weekly grind for players, but you can see the protagonist’s points as well can’t you? The travelling ‘pilgrim like’ fans deserved what they got at Salford, but certainly don’t warrant the disappointment they got against Warrington and its such peaks and troughs that are so bloody frustrating isn’t it? Whatever team we had fielded we would have probably lost that game last week, because ‘The Wire’ were red hot, but playing at home in front of 10,000 fans we could at least turn up just like (with 11 missing), we did in front of 2000 yeaterday.. Still at Salford if the performance was a bit patchy the result was brilliant and the wanting and passion superb! Last week was best described in the Yorkshire Post as ‘shocking and pretty gutless’, which for a lot of FC fans I spoke to in the week was almost unforgiveable. It will take some time to get it completely out of my system and maybe only us tonking one of the top couple of sides or the Dobbins at the KCom will do that, but yesterday’s was a good win, a step forward and it went a long way to at least starting the process. It’s now time to look forward to Saturday in Catalan when we play the team that this week inflicted the first defeat of the season on the then League Leaders and favourites for the title. It doesn’t get any harder than that, does it? Thanks to everyone who has been in touch and sorry for a bit of negativity this week, but writing some of it mid-week as I did this time around, I was still a little raw. As always, I just tell it as I see it and if I have upset anyone I apologise. 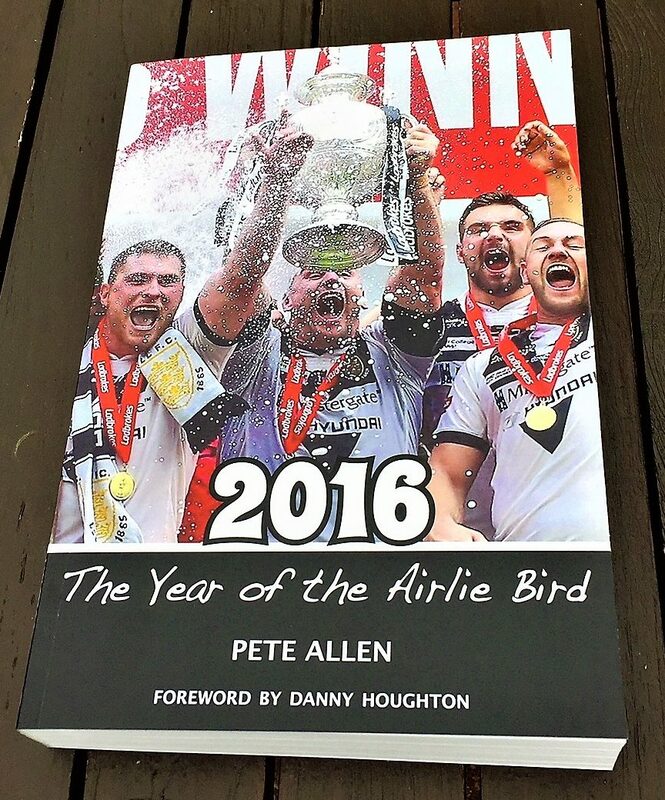 In the end the one thing that is for certain is that we all love Hull FC and we probably will till the day we die. That’s why we get so passionate about it all. I’ll speak to you all again next week and to those who are travelling to France have a great time and a safe trip!